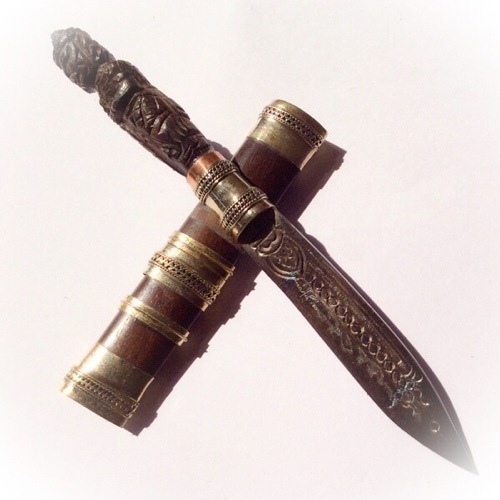 Mitmor Taw Waes Suwan Asura Deva ritual knife in 4.5 inch portable size – made from tamarind wood with silver bindings. This sacred hand carved sacred wood spirit knife, with an image of the Asura Millionaire King of the northern Quarter of the Jadtu Maha Rachuga Celestial Realm, and one of the four Asura Kings. 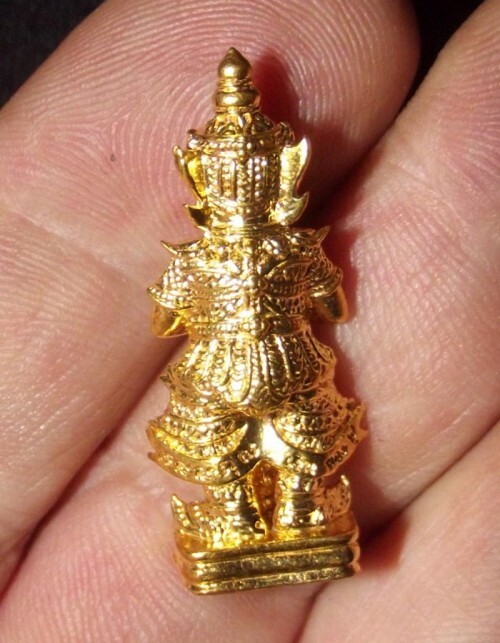 The image of Taw Waes Suwan (Kubera), is carved into its handle, has been made and empowered by the great Luang Por Prohm of Wat Ban Suan, in Pattalung. In addition, Ajarn Spencer kept them during the Wai Kroo and Ritual Boiling of Amulets in Herbal Metta Oils for a final empowerment. 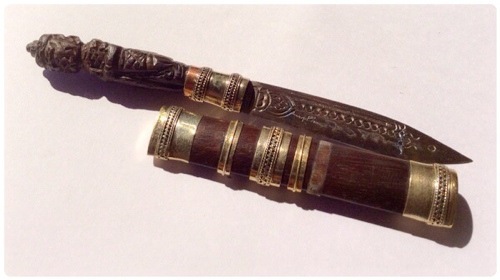 This is one of small numbers of sacred ritual knives, made from bone, and also sacred wood. The Mitmor have been resting at the Asrom Por Taw Guwen awaiting a further empowerment held on the sixth of March 2557 BE, in Wai Kroo ceremony. You can see video documenting Ajarn Spencer’s ceremony at the bottom of this article. Taw Waes Suwan Asura Deva is not only a God of Wealthy Businessmen, but also a powerful protection against black magic, and also a protector of Buddhism, and prevents you from cashflow problems. He guards over your previously accumulated wealth and possessions, and increases your social and professional status, and chances of promotion and professional advancement. Luang Por Prohm has previously empowered the Mitmor, after inscriptions being made by Laymaster Ajarn Plien (Wat Don Sala). This item will be available and placed in stock, as of 6 March 2557.because the knives are made from natural sacred treewood, or bone, the colour of eachof the bone versions is slightly different, and can range from medium brown Siena, right up to pure white. The wooden versions are all similar in color. It’s carvings are slightly different in detail with each knife, and appearance, because it is individually hand carved, by the artisan. The colour of the item can therefore not differ slightly from the colour tone of the item in the image. They are however all equally attractive in all numbers of this series, and each item is unique in itself, for its difference in appearance. 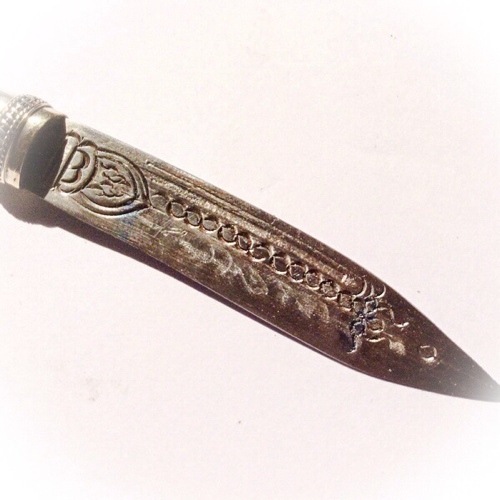 The quality of the carving and the empowerment that has been performed is identical with each ritual knife. The knife measures five inches in the sheath. They were made with various carved bone, or wooden sheathes and handles, in different forms, including these Ganesha, Por Gae Lersi, and Taw Waes Suwan Asura Deva. There are a multitude of ways in which the Mitmor Taw Wes Suwan can be used. For instance, as a ritual instrument it can be used for making holy prayer water. One can then use this consecrated water for treatment of physical ailments (abscess, etc.). When wandering through the forest, one can draw a magical circle on the ground where one will spend the night. 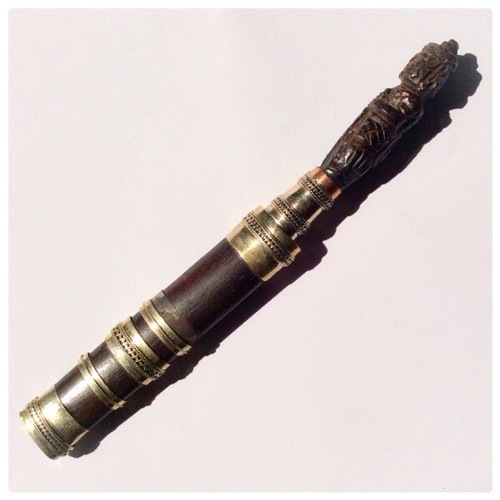 The magical powers of Taw Wes Suwan will then offer you protection against attacks from various venomous animals, black magic, and harmful ghosts and spirits. Sacred Khom (Ancient Thai-Khmer Pali Script), has been inscribed on the surface of the carved sheathes and the handles, as well as having been engraved into the surface of the metallic blades, imbuing them with the power of ancient invocations. Empowered with the sorcery of the Masters of the Southern Khao Or cave Temple, and the lineage of Pra Ajarn Kong (Wat Ban Suan). Inscribed by the laymaster Ajarn Plien, of Wat Don Sala, and blessed at Wat Ban Suan in Putta Pisek ceremony. Lord Waes Suwan is an Asura Deva, he is the King of the Northern Jadtu Maha Rachiga Kingdom – Lord of Treasures and Wealth, Protector against Demons, Ghosts and Malefic entities. Taw Waes Suwan should be revered by businessmen and financiers, and anyone who wishes to increase his financial and material wealth. Also, in times of hardship and poverty, one should revere Taw Waes Suwan, which will enable you to have enough money to pay your bills and the cost of living with without any difficulty. Taw Waes Suwan is Responsible for chasing away and warding off Yaksa, Maras, Ghosts and Demons, and protects from all enemies. 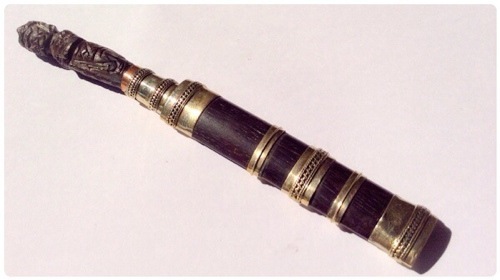 The blade is covered with sacred inscription of Sanskrit spells engraved upon the edges of the ritual knife. If he guards over you, the Asura and other Monsters will not dare to bother you, for he is indeed their King, Lord and Master and his Kata can bind and control them (The Aadtanatiya Paritta). His crystal club punishes any who dare to risk coming near with thoughts of harm. Taw Waes Suwan is an Accomplished Meritorious Wealthy Lord, whose great successes and efforts resulted in his amazing wealth and power over his minions. This elevated him to a Deva in the Dawadeungsa Heaven. Wae Sa Pu Sa (pronounced ‘Way Sa Pu Sa’). 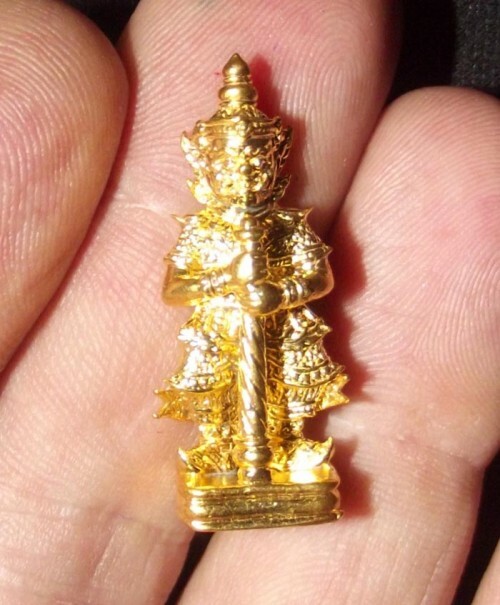 Released in the Internationally Acclaimed and Popular ‘Sae Yid Choke Lap Foo 2552 BE’ edition of Sacred Thai Buddhist Amulets from Luang Por Foo of Wat bang Samak. This Edition recieved National interest and Media Coverage, and was waited upon with Great expectancy. 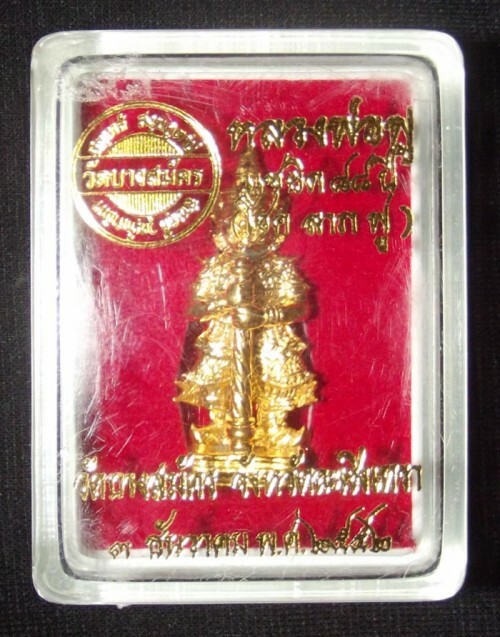 The amulet is made from a mix of Bronze Sacred Artifacts and Yantra Foils, smelted into the Chanuan Muan sarn. Sacred Powders are hidden within the interior of the statuette. 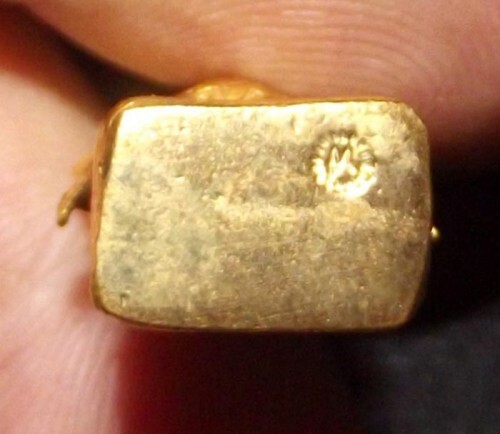 This version in ‘Nuea Galai Tong Tae’, is covered in a Luxurious Coating of Pure Gold. It was one of the Decades most Documented and Popular Editions, and all amulets in this Edition were officially cataloged and documented, making the a safe bet for collectors and connoisseurs as well as those who like to speculate with amulets that increase in value as time passes. Luang Por Foo was the First Apprentice in Magic to Luang Por Ding, and is considered one of the Country’s most Prominent Gaeji Ajarn Guru Monks. 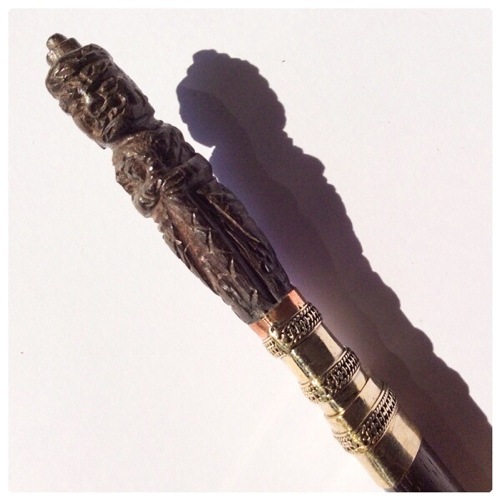 This editions main aim was to increase Wealth and remove Obstacles, and Protect from Dark Magic. 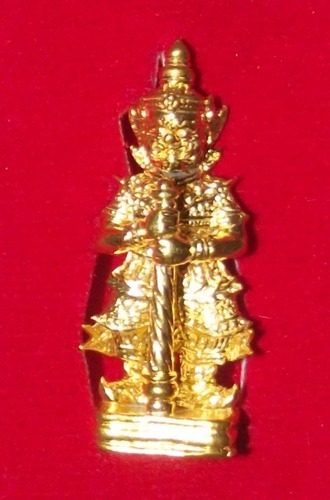 The Edition included a large range of Hanuman Amulets in various sacred Metals, some Palad Khik Dtua Kroo, Sethee Navagote (Nine Faced Buddha of Wealth), and these Taw Waes Suwan Asura God Amulets. 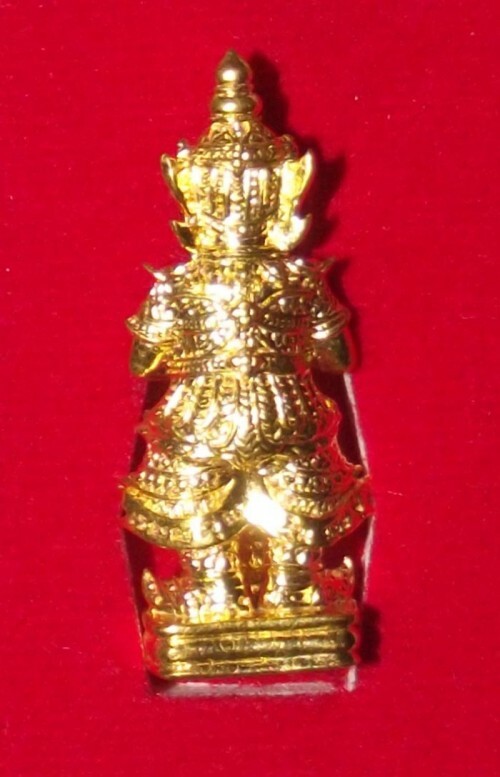 The Taw Waes Suwan amulet was made in varous different materials including Nuea Tong Daeng, Samrit, Tong Rakang, Galai Tong Tae, and Sam Kasat (Bronze, Silver and Gold metals). They were made in Pim lek (small) and Pim Yai (large) sizes. Comes in Original Temple Box – Can be Encased if Desired. « Pra Somdej Pim Yai – Jao Kun Sri-Wat Ang Sila 1st Prize Winner.